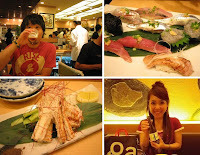 Again, after so long, we've been to Midori-zushi on Saturday!!! I just realized last time we went there was October 2009! Almost a year ago!!! Since my favorite anago (conger eel) is in season, I ordered "anago no shirayaki" which means anago is grilled without sauce and the color is white (left bottom image). You enjoy it simply with lemon, yuzu kosho (yuzu pepper), or ume paste. Yummy!! !